FIGURE 1 ■ Ureteral expansion was performed using a novel silicone balloon TUEC catheter having two channels: a smaller channel to inflate balloon (c1) and a larger fenestrated channel to drain kidney (c2). The 14F shaft has multiple holes to facilitate proximal urinary drainage. The balloon (b) has one radiopaque marker (m1 and m2) at its either end to facilitate fluoroscopic confirmation during placement. Additional radiopaque marker (m3) on shaft immediately proximal to last drainage hole should lie within kidney. 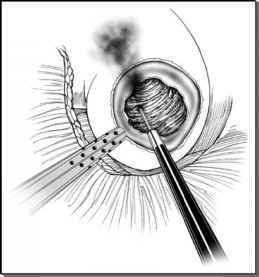 Terminal end of catheter is fashioned into a pigtail to facilitate retention in bladder. Single-step dilator (d) is used to position 20F peel-away sheath (s) within renal collecting system. FIGURE2 ■ Procedures of percutaneous insertion of TUEC, and inflation of balloon. Balloon position. (A) Deflated balloon is positioned in juxtavesical ureter. (B) Incremental progressive inflation of balloon causes chronic expansion of juxtavesical ureter. (C) Expanded juxtavesical ureter. Note laterally based vascular supply to expanded ureteral segment from internal iliac vessels. 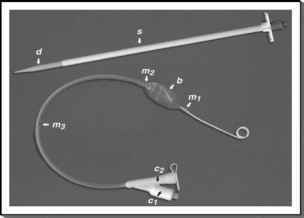 dilation balloon (Uromaxa) was used to dilate the entire ureter in a stepwise fashion over a period of two minutes to facilitate subsequent passage of the novel expansion device. The adequately lubricated balloon expansion catheter was gradually manipulated antegrade into the ureter over the Superstiff guidewire (Fig. 2A). The balloon, flanked by radiopaque markers, was positioned in the juxtavesical ureter and distended with 2.5 to 3 mL of contrast medium to secure it in position (Fig. 2B). The excess proximal length of the catheter exiting the animal's back was tunneled subcutaneously so that only the inflation and drainage ports were visible outside the skin.